The country’s exports have surged by 1.7pc in the first half of the current fiscal year (July-Dec 2018-19) and stood at $11.186 billion as compared to $11 billion in the same period last year. However, it surged by 4pc to $2.06 billion in December 2018 as compared to November 2018. After a 5.6pc depreciation in the trade deficit, the total deficit stood at $16.940 billion in July-Dec 2018-19, as compared to $17.939 billion in the same period last year. Prime Minister Imran Khan, ever since taking charge of the government in August last year, has been formulating various strategies to overcome the rising import and current account deficit, which had touched $18.9 billion in 2017-18. The central bank had received $2 billion from Saudi Arabia in the head of financial assistance, while $1 billion is expected to be received this month. The Saudi government had promised to give $6 billion to Pakistan, including $3 billion oil on deferred payments for the next three years. Meanwhile, the Chinese government and the United Arab Emirates (UAE) had also promised financial support to Pakistan. Pakistan team, headed by Finance Minister Asad Umar, is also negotiating with the International Monetary Fund (IMF) to get $6-$7 billion. The State Bank reserves stood at $7.048 billion, which are less than the import bill of two-month. Total reserves of the country stood at $13.597 billion. The imports of the country have gone down by 2.8pc to $28.126 billion in July-Dec 2018-19 as compared to $28.941 billion in the same period last year. On yearly basis, it decreased by 8pc to $4.493 billion in December 2018, as compared to $4.910 billion in same period last year. On a monthly basis, it increased by 3pc. The import bills had touched $55.8 billion in 2017-18, which were more than double of the total export inflows of $24.772 billion. No real achievement. Imports fell 2% while oil prices have decreased 13% in the same periode. As oil is 25% of our imports, the total import bill should have decreased by 3.5% without doing any thing else. Using numbers like PML-N, I see.Petrol prices have come down to $60 from $90 in past six months which decreases our import bill.Dollar have gone from 122 to 140 which increases the exports.Simple as that. Wasn't oil price even lower than today in PMLN's era? And were they not throwing billions of dollars in the market to keep its value stable, thus affecting exports? 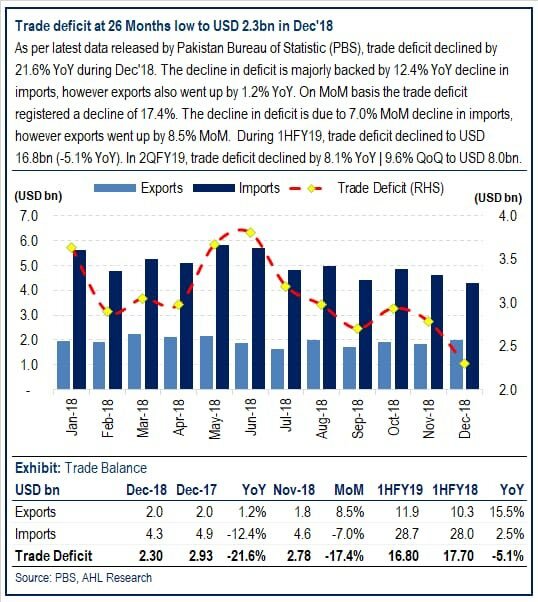 Pakistan’s trade deficit in July-December, the first half of the fiscal year, narrowed by 5 percent from the same period in 2017, helped by efforts to curb imports and ward off a looming balance of payments crisis, the finance ministry said on Thursday. The trade deficit fell 5 percent to $16.8 billion, from $17.7 billion in July-December 2017, with imports down 2 percent to $28 billion from $28.7 billion and exports up more than 2 percent in the same July-December period, the ministry said. In the month of December 2018, imports fell by more than 12 percent to $4.3 billion from $4.9 billion in the same month a year earlier, while exports rose 5.5 percent. “Data indicates that the import compression measures taken in the supplementary Finance Act 2018 have firmly taken hold and are now effectively curtailing imports as per policy regime of the government,” it said in a statement. It said the narrowing in the deficit “augurs well for the overall balance of payments in the country”. 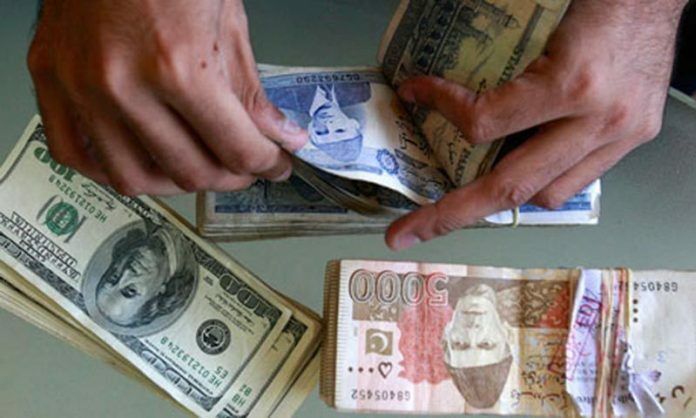 The government of Prime Minister Imran Khan came to power in August last year, facing an immediate balance of payments squeeze that forced it to seek billions of dollars in foreign loans and take steps to bring down its current account deficit estimated at 5.8 percent of GDP. It imposed a series of regulatory duties on a number of items to slow imports. At the same time, repeated devaluations saw the Pakistani rupee lose around a quarter of its value against the dollar since the end of 2017. The trade balance has also benefited from a fall in global oil prices which has eased pressure on Pakistan, a net energy importer. Islamabad is currently engaged in discussions with the International Monetary Fund over a possible bailout although a visit by an IMF team in November ended only with an agreement to keep talking. However the government has agreed a $6 billion package with Saudi Arabia in mixed loans and oil payment deferrals and a similar package with the United Arab Emirates. China has also been reported to have agreed to lend Pakistan $2 billion to help shore up the currency. Without naming anyone, its very clear people will always criticize govt, n i m in favor of that. We cannot give absolute power n no question attitude to any institution. But the satisfying thing is that with pti govt we will get real info of how bad the situation is. Asad Umer is not going to fudge the figures or artificially control rupee value like ishaq dollar.